Ahhhh. The end of the school year and the beginning of summer. It’s the season of pool parties, beach trips, and hanging out with friends. While the mad dash doesn’t come from getting everyone ready for school in the morning, there is still a lot to do. Coordinating everyone’s schedule can start to feel like it’s a full time job, especially if your high school student needs summer school. There is STILL that one extra trip you have to make every day. You don’t have to though. Have you considered online summer school? One of the best aspects of an online education is the fact you don’t have to drive anyone anywhere. Classes are conducted on the computer in your home. Your high school student doesn’t even need to get dressed or put shoes on to attend. Cutting back on one more morning errand can make a big difference for the tone of the day. You can be assured online summer school offers a full course in 4-6 weeks. The classes are condensed and full of information, but they are not water-downed versions of the material. Your student will be learning the coursework on an accelerated schedule, but it’s the same coursework that is offered throughout the year. No cutting corners. If your high school student is falling behind, online summer school may be the answer you’ve been looking for, but it can be used for more than just credit recovery. Plotting your student’s academic portfolio and goals may lead you to the conclusion summer school is the right answer to reach personal objectives. Sometimes trying to get it all done during the school year can be overwhelming. Getting an online education for your family could be the answer you’ve been looking for. Visit Wisconsin Virtual Learning to find out more about how to get started tuition-free. 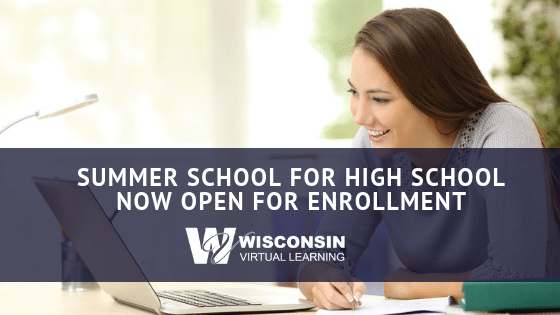 You don’t even have to be a WVL student to take advantage of our online summer school program.